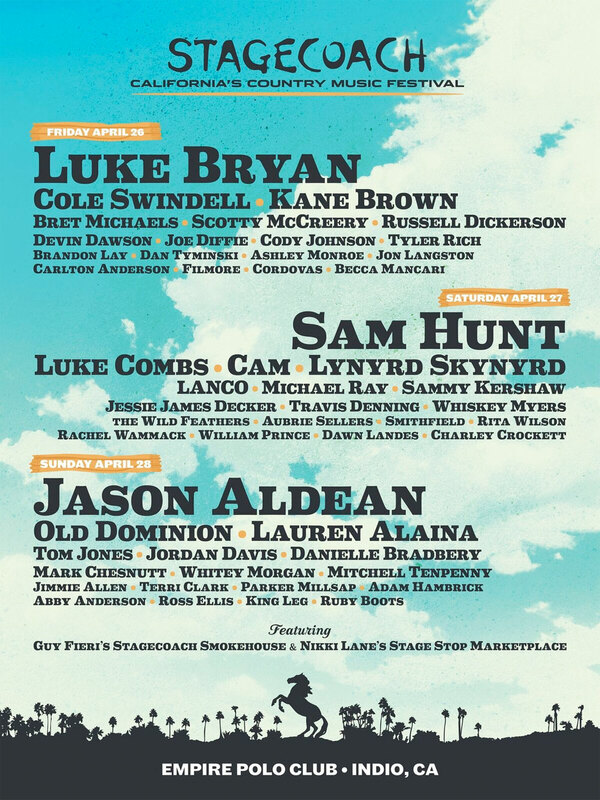 The Stagecoach Country Music Festival returns to the Empire Polo Club in Indio April 26th through 28th starring Luke Bryan, Sam Hunt and Jason Aldean. The Stagecoach Country Music Festival returns to the Empire Polo Club in Indio April 26th through 28th. Starring: Luke Bryan, Sam Hunt and Jason Aldean. Tickets are on sale now at stagecoachfestival.com. Listen to Go Country 105 for your chance to win tickets! The 3-day event will also feature performances by Cole Swindell, Luke Combs, Old Dominion, Kane Brown, CAM, Lauren Alaina, Lynyrd Skynyrd, Bret Michaels, Tom Jones and more. Featuring the return of Guy Fieri's Stagecoach Smokehouse, th e SiriusXM Spotlight Stage, The Bazaar featuring Nikki Lane's Stage Stop Marketplace, the HonkyTonk Dance Hall and much more! Giveaway to run Monday, February 11, 2019 at 12:00 AM through Sunday, February 17, 2019 at 6:00 PM. A winner will be selected each time when they are the 25th on-air caller unless otherwise stated on-air by the announcer. If there is a grand prize winner offered for the week long contest, the grand prize winner will be randomly selected from all of the weekly contest winners on the first Monday after the contest has concluded. 38 prizes to be awarded over the contest. Value for each prize is $658. Grand prize winner will be contacted directly by the Go Country 105 promotions department. All other Go Country 105 contest rules apply.